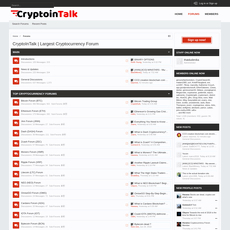 17+ Cryptocurrency & Bitcoin Forums - Cryptolinks - The World's Best Cryptocurrency Sites List! 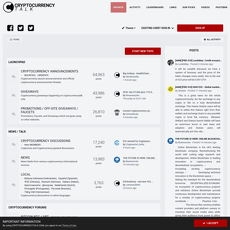 How effective will it be having a platform where you can discus about various cryptocurrencies with a wide range of users. 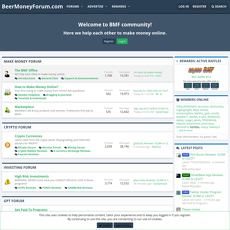 A Forum or discussion board is a platform joining people together to share ideas, have debates and pass information across to each other. There are many times whereby the reason why people don’t get information about cryptocurrencies is because they are not involved in certain platforms. A crypto forum is meant to be like a social community that consist of different people; it could be divided into sections depending on the motive of the forum i.e. 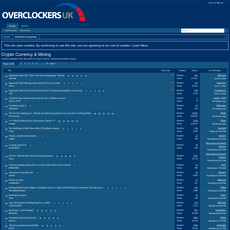 mining, trading, exchanges, news, etc. 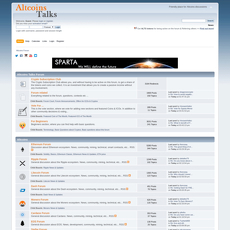 However, for every crypto forum and discussion board, there are limits to what they talk about. 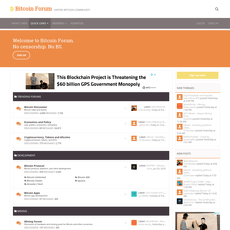 If a forum talks about Bitcoin, it strictly talks about Bitcoin and Bitcoin-related issues, nothing else; but if the forum is versatile, it could talk about different cryptocurrencies and divided them into segments. 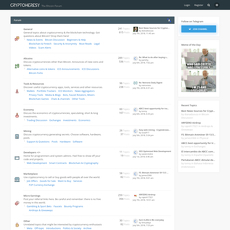 The fact is, only the top cryptocurrencies (Bitcoin and Altcoins) with active engagements in considered. It is important to know that you can have all your crypto questions answered in these platforms and find very interesting topics to participate in, especially if you are a crypto rookie. These sites have been designed to be more user and mobile-friendly with great features and functions. They even support advertisement of crypto products and ensure more people are invited to the platform through their link that could be shared on other social platforms like Twitter, Facebook, etc. Most importantly, they often ask you to follow their updates if they don’t have a news segment on Twitter. The main purpose of all these is to keep users engaged in all crypto activities. These 17 sites are very important and it can be seen that majority of them are interested in talking about Bitcoin rather than other cryptocurrencies. They are more alike in every respect because they all include users who are ready to share ideas with others. This looks funny but the purpose of the forum or discussion board is important. 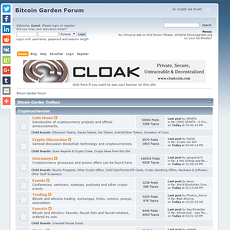 If a crypto forum or discussion board has irrelevant topics which is not useful for you, it is best to stay off such platform. Go for something that adds value to you and to your coins. It is possible you jump into a discussion and before you know it, get spam messages or even increase the risk of getting your account exposed to fraudsters and hackers. 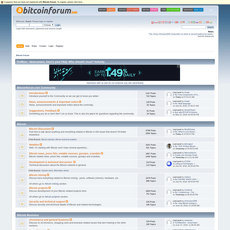 The purpose of a forum is exactly what sells such forum out, it must be able to offer something meaningful. 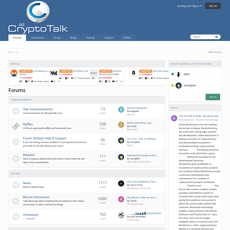 Also, the activities that take place on a crypto forum is important because you wouldn’t want a place that looks deserted with little or no information. If a forum has a good or great number of people who are contributing to the platform, then be sure you made no mistake selecting such because the higher the number of people, the greater the activities and ideas shared. 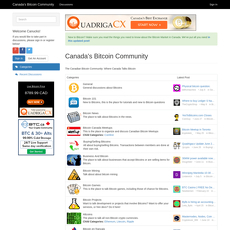 Such a forum must be able to link you to a social community where you can invite your friends. 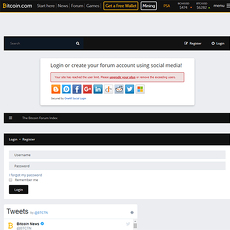 One more other thing to consider is that such forum must be mobile friendly and has the ability of blocking spam messages or bugs that pose risk to a device. 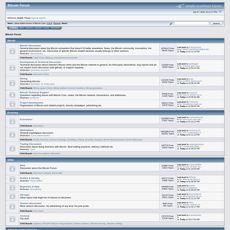 If a forum has a mobile app, it would be much more preferable to log on to such forum and start a discussion without having to wait for a web address. Lastly, the architectural design of the forum must be topnotch i.e. 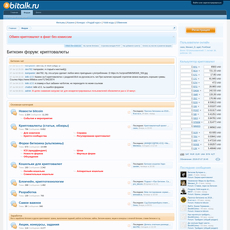 improved with advanced themes and not those with plain designs having too much information displayed on the home page. 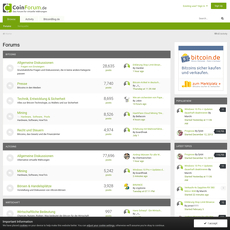 All these factors are responsible for how a user chooses his or her forum or discussion board. 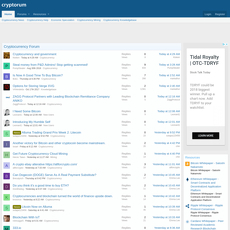 Discussion boards and Forums have been known to be helpful for many years and when it comes to cryptocurrencies, it gets much better because there is always enough information about them on a daily basis. 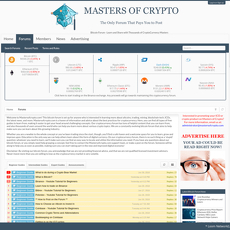 In conclusion, out of the 17 sites listed, the best for Bitcoin and the best for all cryptocurrencies can be selected easily if you consider the kind of features they have and their pros and cons. Pros are available so you could know their good side while Cons are available so you could know their shortcomings.